WordPress 3.2 has made a million downloads, which was released on July 04, 2011. 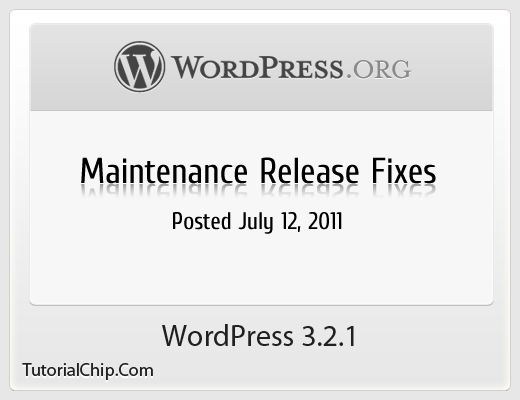 WordPress has released a new version just after eight days, on July 12, 2011 by fixing a couple of important issues. WordPress team is working very efficiently to keep this most popular blogging software, clean and secured. WordPress 3.2.1 fixes a server incompatibility related to JSON. Some important updates in the new dashboard design. Fixes in the new the Twenty Eleven theme. We will recommend to update your WordPress blog as early as possible. It will keep your WordPress blog fast, secured and reliable. Following links will help you to to update your WordPress blog. Update immediately from the Dashboard → Updates menu in your site’s admin area. TutorialChip themes and plugins are best compatible to this new version of WordPress 3.2.1. You may be interested to check our themes, which are not only free but having a full support forum by us and other TutorialChip community. Don’t Forget to Follow us on Twitter or Subscribe to Email to Get the Latest Updates on Giveaways, Tutorials and More for Free.